This was an interesting one to answer, especially considering I’ve definitely said on more than one occasion, “I wish there were just one big RP realm for us all to go to!” When I finally had to consider how having only mega realms would actually turn out, I began to realize that I didn’t actually think it would work, and for more reasons than just roleplay. Mega realms would affect everything, from PvE competition to the AH to keeping sane in a PvP world. I’m not convinced that the benefits would outweigh the costs. All the RPs in one place! So many times during my WoW career, my guildies and I have discussed how we would love it if there were only one RP realm, a halcyon place where there would be not a single character whose name references a bodily function or any variation on PwnsU. A place where people actually care about the lore! A place where we can RP out in the open, without worrying about someone taking off all their armor then jumping around our RP events naked! IT WOULD BE GLORIOUS! My main server is one of the original RP servers. Perhaps there was a time when RP was rampant on the server, but that time is long since passed. Nowadays, Argent Dawn feels more like a PvE server with slightly better names. I know more non-RP people than not, and even my guild hasn’t done any serious RP in months. It’s sad. I think that a lot of the older RP servers are in the same boat. People join the server because they have friends there, not because they’re interested in roleplay. Slowly the balance starts to shift. Best case scenario is that RP just isn’t that common anymore. Worst case is that it’s actively griefed to the point where those who are interested in roleplay head to a new realm. And so it continues. That’s why my friends and I have often said we wish there was just one realm for RP, so all of us who are interested in it are in the same place. But unlike PvP or PvE rules, it’s not really possible to enforce RP, not even with things like name reporting. You can’t exactly force a person who’s not interested in that sort of thing to do it. And eventually I suspect the same thing would happen on that single RP realm. People would come there to play with their friends, and slowly it would just morph into a normal PvE realm. To be honest, this is why the cross server zones have me concerned as well. I will occasionally go play on other RP servers, just to see what things are like on them. Wyrmrest Accord in particular is one of my favorite places to go level up a random toon because there is just so much RP going on there, especially as compared to AD. I constantly see people sitting around in random taverns out in the world, having awesome in character conversations. Trade chat has a ton of RP guild ads in it. People will randomly start roleplaying with me while I’m out questing. It’s awesome! Then I think about Mists and how people from that server are going to be forced to be out there with people from mine, and other RP servers where people don’t care about RP. And it makes me sad. There’s something really special going on there, and I would hate to see it lost. If there was only one place to RP in WoW, one might expect for everyone’s RP to be interconnected or at least have acknowledgment of one-anothers’ storylines. But in reality, most attempts for realm-wide, centralized RP would be too unwieldy to go anywhere because of the sheer population. There have been realm-wide RP events before but they were limited to the pop of one realm. This is an interesting concern, and one that I think has merit. It kind of reminds me of whenever there is some sort of neat free event that happens in NYC that becomes completely unfun because of the sheer amount of people there. You wanted to watch the Halloween parade? Okay, but I hope you got there six hours early because they’re blocking off the roads and sidewalks after that. Oh, you thought it would be cool to go to the free Robot Chicken Rollerskating party? You’ll be waiting three years for skates and you’re only going to get about ten minutes in them. Having an entire mega realm full of people to RP with would be amazing, but I can’t even imagine how going to Stormwind or Silvermoon would be. Just /say chat alone would be chaos. People would be forced to do most of their RP in whispers or party chat just to avoid getting confused. And that would defeat the whole purpose of having a realm where you can RP out in the open. One single RP (well, and RP-PvP) realm would be amazing if everyone really did want to RP. There would be enough people around that no matter what kind of RP you were looking for, you could probably find it. You could find guilds that wanted to both RP and raid. Or RP and PvP. Or just RP and RP. That part of it would be awesome. But those other parts? I’m just not sure it would work. One of the things I love about WoW is that I can play it on my aging iMac. Sure, I have to have my graphics set to low and my computer tends to freak out if I try to do something crazy like heal an LFR. But I can still play. Even with there being less people on RP realms than other realms, I cannot fathom what it would do to my computer. Actually, I think I have an idea. I’d get 1 frame per 12 seconds and then the entire thing would quit. I think the technological accessibility of WoW is a big part of its success. I would have never played it if Blizzard didn’t offer the game for both Mac and PC. Eventually I realized that if I wanted to keep playing I’d have to install more RAM and actually update my OS, but since I already bought into the game, those decisions were much easier to make. If I thought I had to have a whole new rig just to get the game running when I first started playing? Forget about it. I would have gone and found myself some other hobby. I don’t think there would be enough baby spice in the world to shrink all the idiots who would be sitting on mailboxes with their giant mounts. I fear the thought of trying to get a quest specific mob when competing with so many others. 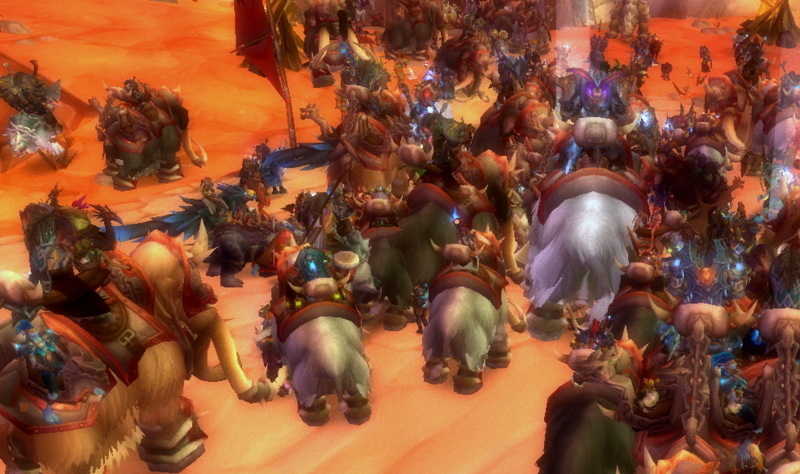 I have seen over a million WoW players jammed into one spot. It was called the Pandaren starting zone on the Beta. It was not a pretty thing. I eventually got so fed up with it that I logged off, and haven’t really done much with the beta since (though there are more reasons for that then just the terrible lag). Even if Blizzard has the technology to make four realms per region work, I doubt that many of the players can do the same. With such a wide audience, it’s just not realistic to expect players to have cutting edge rigs that are capable of showing that many players all at once. Or you know. Letting you heal an LFR without slowing to molasses. /eyes Newegg cart longingly and contemplates hitting the “order” button. There are notorious folks on my realm. The trade chat idiots. The people who are getting the server firsts. That person that always hangs out by the same mailbox as you and keeps throwing a heavy leather ball at you while you’re not looking, leaving you wondering why your bags are full when you go out later to solo some old content. 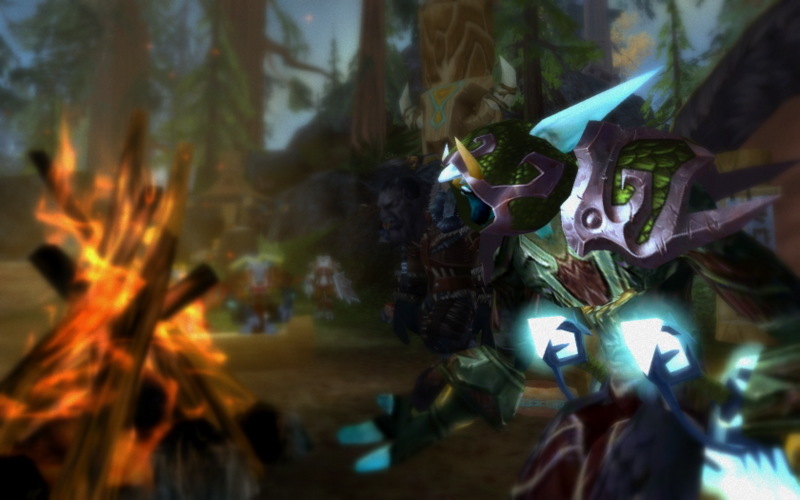 There’s a niceness about familiarity, both in WoW and not. Would it be possible to have a level of familiarity on a huge mega realm? Well, sure, but it would be more along the lines of celebrity than community. I think the idea of having four realms per region is an interesting one. It would definitely make the world feel more “real.” But I’m not really sure that’s what the game needs. I’m not sure if I want to deal with real world levels of competition in a game I use as a break from reality. I’m not sure if I want to deal with an auction house with that many people using it. I’m not sure I want to see only four guilds in a region getting server firsts. I’m not sure I would want to deal with not being able to get away from people who piss me off because the only other choice is to play on a realm type that I don’t enjoy. I wish my realm had more RP and had some more stuff going on with my faction, but not at the cost of those other things. Check out some of the other responses to this topic from around the community!